First up – my news: This would be the ‘ice’ section of the title. I’ve got a story appearing in the next issue of Litro Magazine. Theme? Myths & Legends! My favourite sort of thing! It should be out in a couple of weeks (available in various outlets across London, including Waterstones, but I think outside of London you’ll need to go online for it). I’m particularly pleased that they picked up the story in question (‘Fimbulwinter’< ice! cold!) because though it’s one of my favourites, I thought it might have trouble being placed. It’s a bit of an odd duck; sort of quiet, with an ending that made me cheer when I wrote it (and still does, inwardly, on rereading), but I thought it might only appeal to, well, me. I’m double-glad it was picked up by Litro, because even without my self-interest, it’s a very, very good magazine and a great read. So keep an eye out and grab a copy if you can/want. I responded because God forbid I should ever miss an opportunity to bring up Patrick Ness’s The Knife of Never Letting Go, and the way he basically (metaphorically, whatevs) takes said knife and stabs you right in the heart unexpectedly and without mercy midway through the story. [I’m not getting more specific here in case some of you haven’t read it (if you haven’t, you really should). If you have read it, you know exactly which bit I’m talking about and your chin should be trembling with the memory of it.] So, that won. I DM’d my address to Francesca Haig and a copy of the book (signed and with a postcard!) wung its way to me. 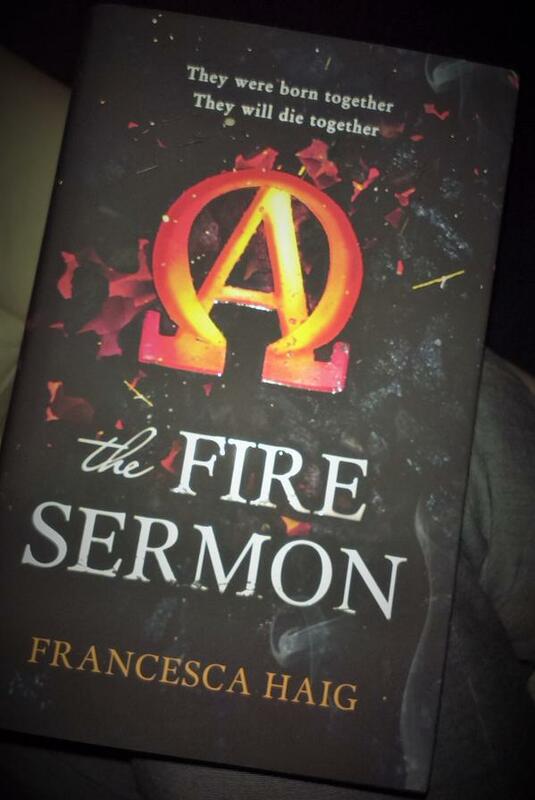 … And I, sort of, in my head, freaked out a bit – because I’d read nothing of what Fire Sermon was about, and I had this vague idea that I HAD to like it because it was personalised, and what if I didn’t, and I’d have to unfollow FH rather than admit that it wasn’t my cup of tea, and so on. Unfounded fears, my friends. Totally unfounded. The Fire Sermon is the sort of book that would get written if someone delved into my head and picked out prime examples of all the dystopian, YA, 1950’s sci-fi, John Wyndham-y, Brother in the Land-y, Jean Ure-y, (I’m talking Plague 99-era Ure), Gemini Factor-y, sheer enjoyable goodness that I guzzle up and love – to the point of almost wanting to do a PhD on this stuff – and turned it into one really well-written story. I’m not even slightly joking when I say I am probably precisely the target audience for this book (series? Oh please oh please). I was over-excited about little references to the point of tweeting at Francesca to check that they were deliberate (and then I stopped doing that because I didn’t want to get creepy). I loved it. I highly recommend it. It’s a cracking story and contains some beautiful writing. I cried on the train over it, and also wanted to brain the person next to me who was unfeelingly having a phone conversation and ruining the mood when I was clearly having all the emotions. (I twigged what was coming just a few pages before it did, and started to get all tight around the chest in advance, oh god.) I’m giving nothing away as to what happens, but if you like anything at all of what I’ve listed above, I think you’ll like The Fire Sermon. I am very aware that this reads like the least-balanced review ever, but I read a lot and it’s rare that something I have no preconceptions of is handed to me, and even rarer that something I know nothing about hits all my favourite buttons. Also, it’s my party and I’ll rave if I want to. Third item: it’s time to try and get stuck into the lit scene up here, and with most beautiful timing, the inaugural Newcastle Poetry Festival is taking place next week. Free events (though booking is necessary), so I’ve claimed day passes and will be heading that way next Friday and Saturday. There’s a lot of good poets reading (including Kei Miller, who also has a fantastic blog that I love because it’s incredibly educational, and George Szirtes, and… just click here and see for yourselves). I am a bad poet-reader and do not read enough, so I’ll be reading a lot of poetry before going to re-/familiarise myself with some work, and I hope I’ll meet nice people there. If you happen to be going and you spot me, please come up and say hi. I’ll be the slightly awkward woman, sitting by herself. I’m also looking at reading groups (though my track record with them is bleurgh) and I’ve been looking up info on tri clubs. Last but not least, I’m going to give an internet-blocking app a go for the next couple of weeks, to try and kerb my internet habit a bit while I get stuck into some nagging stories and pomes.